I've been loving red lentils lately. So good for you- high in protein and fibre, chock-ful of B's and a great source of iron. They cook really fast as well and are so delicious. Just as we're entering fall, here's a delicious soup bursting with all sorts of different bright flavours. 2- Add the other vegetables and spices. Stir well and cook for 3-4 minutes. 4- Cover the pot and cook for about 25 minutes. 5- Add the coconut milk. 7- When serving the soup, ladle a couple cups into a bowl and add the desired toppings. A couple spoonfuls of rice makes it just a little more filling. This delicious concoction is also vegan and a great way to sneak all the different veggies into my kids' bodies. We have been trying more meatless meals recently and this one will definitely be on repeat in our house. This is a great soup! 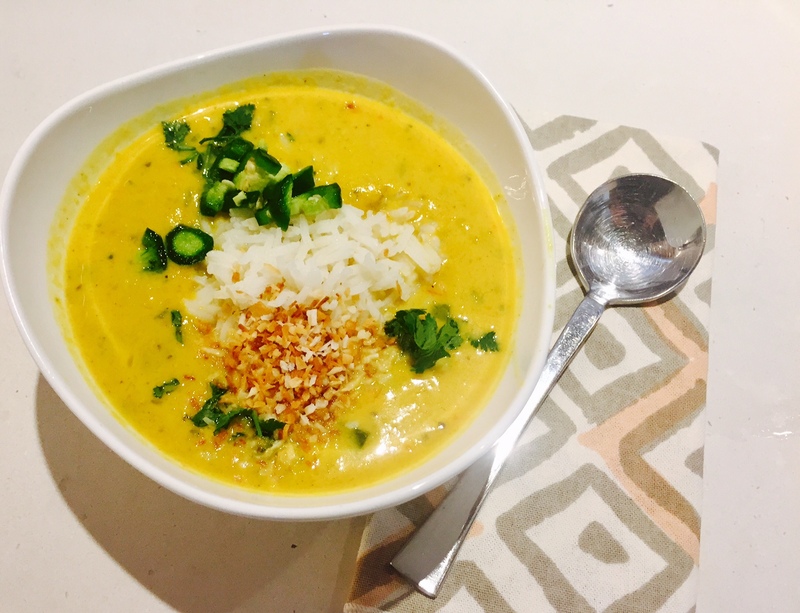 I love a creamy soup and with lentils I am all over this with my immersion blender (my newest toy!)! Pinned! I am all about lentils lately. Can't wait to try this out! Definitely saving this. Looks like dhal (tho I know its not). Love me some soup and will be trying it! This look amazing! Never tried anything like it but the ingredients are right up my alley! Yummy!! Definitely saving this one for later.